A strong invitation to humility and solidarity is found in the Gospel of Mark. Last Sunday, Mark 12:38-44 was proclaimed to us. It talks about a poor widow who gave everything she had to live on in charity (v. 42). Several things we learn from that profound and meaningful story. A poor widow is used as the model for selfless giving. Her trust in God led this woman of faith to abandon herself in God’s providential hand. May our giving be a sincere reflection of faith put in action! Jesus places great importance, not in the amount that was given, but in this woman’s intention of heart. She knows what it means to live in poverty, so she shows unconditional solidarity, ignoring her own needs and fully trusting in God’s divine plan. May we give not out of our abundance, but out of sincere love and care for my brother’s well-being. Jesus Christ, our Lord and Savior, wants us to avoid hypocrisy at all cost. So he warns us and even speaks strong words to those of double life. In this Gospel passage, we are told Jesus was teaching (v.38) his disciples and saw selfish attitudes from Churchgoers. There were then some wanting recognition (v.38-39) and other dishonest persons (v. 40) in abuse of power. Let us be well-intended parishioners. Yes, dear friends in Christ, we are also called to share in generosity and solidarity. The widow’s offering reminds us of other Biblical characters like Abel, who gave the best animal production to God; or Jesus himself who offered the best to the Father, his own life for the salvation of all. May we share the best of ourselves, or of our production, or of our earnings to God. 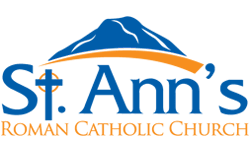 Consider therefore contributing to St Ann’s Parish, as a humble and generous giving to God and fellow man. United in prayer, I sign.